Yes, OmegaBrite is gluten free. Why does OmegaBrite have vitamin E? OmegaBrite contains a small amount of vitamin E to further prevent oxidization and maintain freshness. How is OmegaBrite different from flax seed and flax seed oil? OmegaBrite is 90% Omega-3 essential fatty acids derived from marine fish oils. Flax seed oil is from a plant source and is an 18 chain Omega-3 EFA. How much EPA and DHA are in each capsule? Each OmegaBrite capsule contains 350 milligrams of EPA and 40 milligrams of DHA. 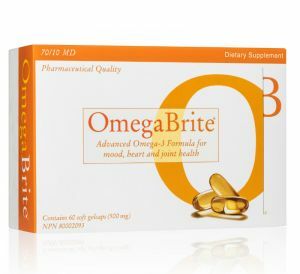 The recommended serving size of OmegaBrite is 3 capsules with a serving containing a total of 1050 milligrams of EPA. 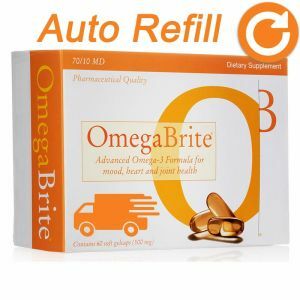 The recommended serving size of OmegaBrite contains 150 milligrams of DHA. I heard OmegaBrite Gelcaps were clinically shown to reduce stress in a recent study, can you tell me more?